It is a Christmas theme here on Sepia Saturday 157 and I have two contributions for the party. 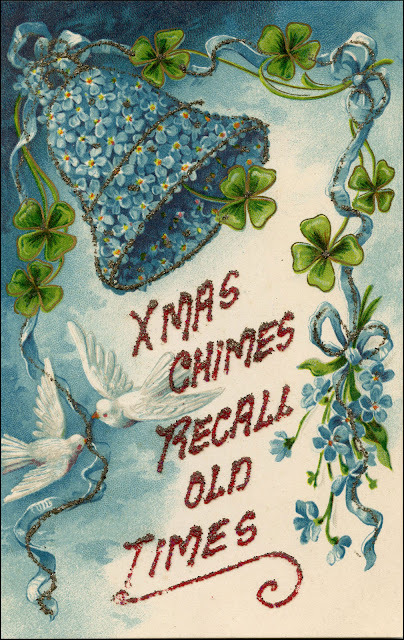 The first is a postcard dating from the first decade of the 20th century which has the line, embossed with glue and glitter, "Xmas Chimes Recall Old Times". It is a suitable theme for Sepia Saturday which, each week of the year, recalls old times in a chiming melody of images. Sepia Saturday is three years old now, and still going strong, and the inclusion of this card gives me an opportunity to wish all the Sepia Saturday participants from all around the world, a very Merry Christmas. In the best traditions of Sepia Saturday, my second contribution is a family photograph dating back to the early 1950s. The little lad in the checked shirt and waistcoat, checking to make sure that Santa Clause isn't handing his brother a better present than he has just received, is, of course, myself. The occasion will have been the Annual Works Christmas Party put on by my fathers' employer : John Mackintosh & Sons. Mackintosh's were the manufacturers of that most seasonal of Christmas gifts, Quality Street chocolate and toffees. 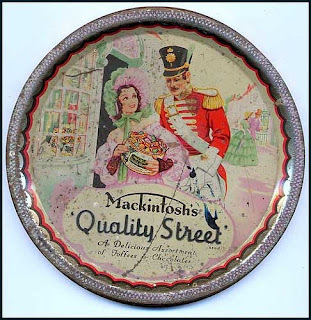 No doubt the present we were receiving at that Christmas party all those years ago would be a half pound bag of Quality Street, but hopefully there would be something else as well, as chocolate toffee penny's and orange creams were mothers' milk to us Mackintosh kids. A VERY HAPPY CHRISTMAS AND A PEACEFUL AND HEALTHY NEW YEAR. As always, you can see many other Sepia Saturday contributions by following the links on the Sepia Saturday Blog. Found in the bottom of a cardboard box : an album of Wills Cigarette cards dating back to the late 1930s. 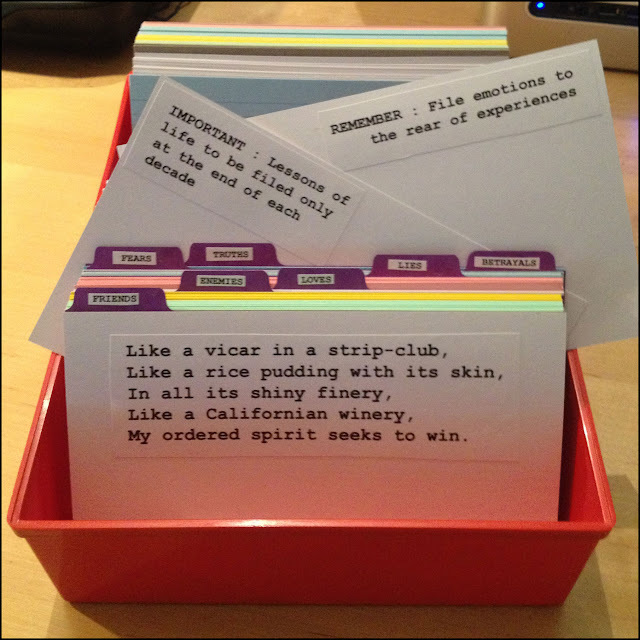 This is one of the cards. The King, George VI, died in 1952, the victim of lung cancer having been a heavy smoker all his life. The Queen, Queen Elizabeth, the Queen Mother, died in 2002, aged 101. Glamis Pit in County Durham was closed in October 1974. W.D. & H.O. 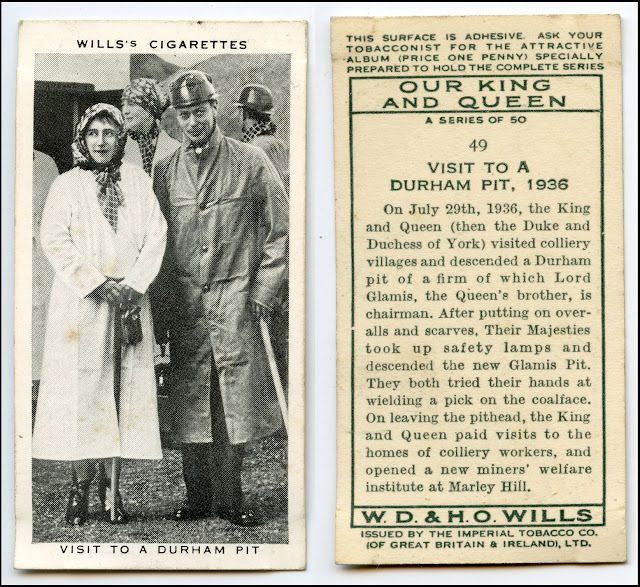 Wills became part of Imperial Tobacco, which still exists today. The life of this particular old dog over recent weeks has been devoted to attempting to learn a whole set of new tricks. Changing computers was just the start : one bit of hardware is very like another bit. The devil is in the detail of the software updates. Not only have I installed Light Room but I have updated my version of Photoshop from one which still had the unmistakable smell of developer fluid and acid hypo fixer. Tasks that were instinctive a month ago now seem to require an obstacle course undertaken whilst wearing a blindfold and balancing a mouse on the end of my nose. And that is a real mouse, as I ditched my computer mouse along with my old computer and invested in a Wacom Bamboo Tablet and pen. 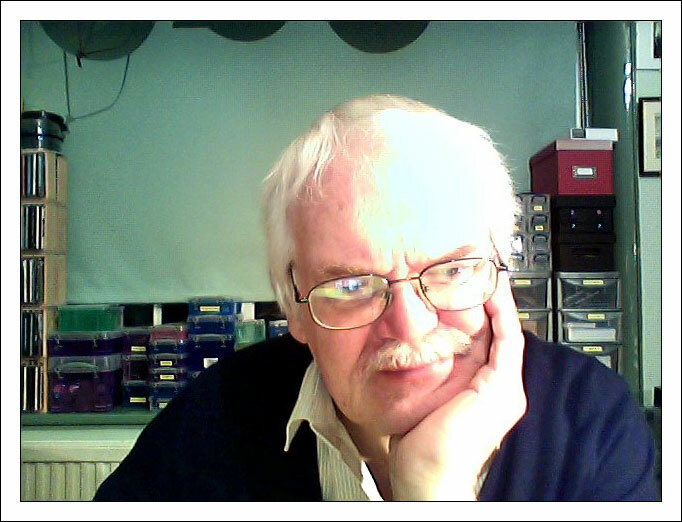 I am currently slowly importing all my old digital image files into Light Room, and because I started taking digital photographs about 15 years ago, that is quite a task. At least it gives me time to review my old photographs, so you will have to excuse me if I take the opportunity to post some here. Think of it as an exercise in new tricks for an old dog. I took this particular photograph in Porto, Portugal in March 2000. I was covering the EU Summit meeting which was taking place in the city and I took advantage of the beautiful Spring weather to explore the glorious old city. I am not certain where I took this photograph. 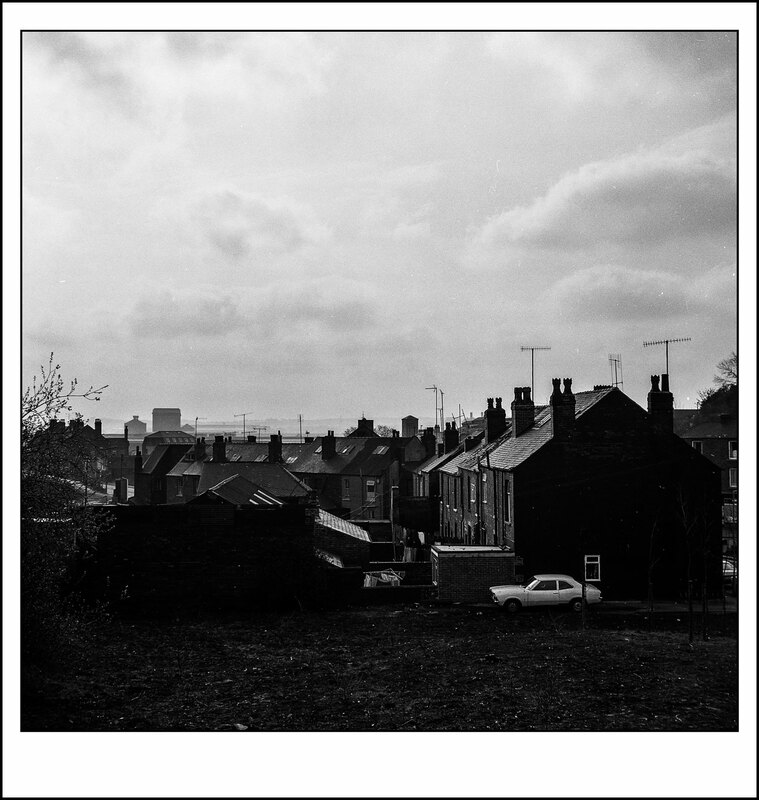 It is somewhere in West Yorkshire, that's for sure, and I must have taken it about 30 or 40 years ago. As so often in this part of the world it is the roof line that is the centre of attention. Shapes fight shapes, orientations have a pleasing diversity, and ostentation is a stranger to these lands and these times. With its grey skies and black earth, all the attention is concentrated on a strip of activity - like the legs of an Irish dancer. It's getting near the Festive Season and it is all Christmas Trees, Reindeer, and Kiss Me Quick Under The Mistletoe : and our Sepia Saturday theme image this week features a somewhat acrobatic kiss. Now call me an old misery if you will, but such activities have always seemed to me to be best suited to spreading herd immunity from a host of infectious diseases; but perhaps such a view comes from being married to a Medical Microbiologist for nearly 40 years. 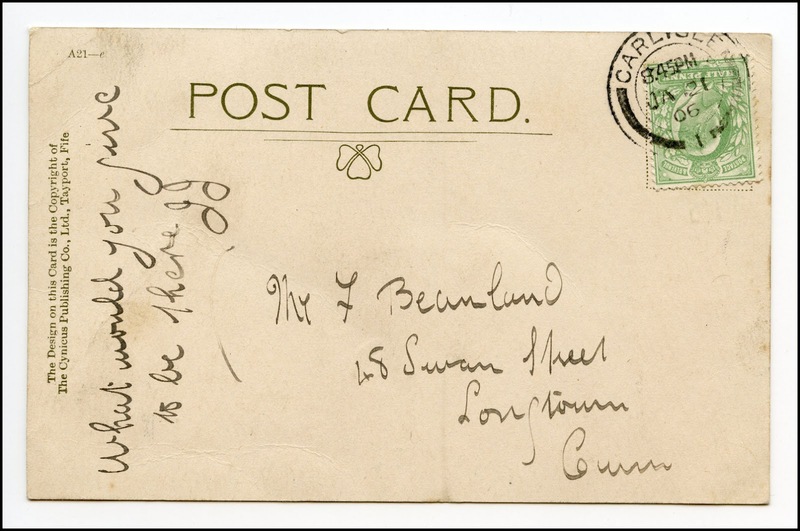 My submission this week is a postcard which dates back to 1906 and which was published by the Cynicus Publishing Company of Tayport, Fife. As you can see we have a similarly acrobatic embrace along with a line from the Victorian song "In The Gloaming". Written by Annie Fortescue Harrison and Meta Caroline Orred, the song is a typical bit of Victorian melodrama about doing the right thing and setting a lover free. Best for you, and best for me." It is supposed to be semi-autobiographical because Annie (a lowly daughter of a Conservative MP!) fell in love with the 4th Marquis of Downshire, but gave him up because she was from a lower class and status and wrote music instead. Some time later the Marquis heard the song at a concert and realised it was about himself and sought her out and proposed to her and they were married in 1877. 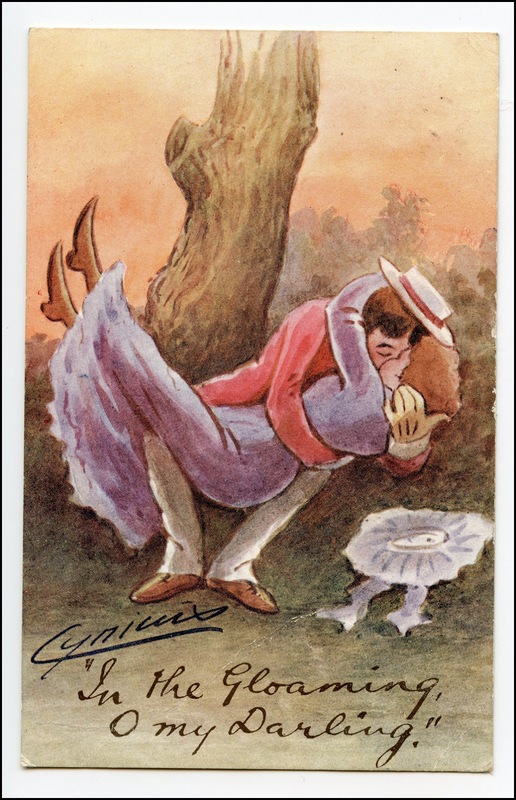 It seems to me to be a little too much like the stuff a celebrity publicist would come out with and, if like me, you can't stand a happy ending, you will be better concentrating on the artist who drew and published the postcard. "Cynicus" was the name used by the Victorian artist Martin Anderson who gained fame during the picture postcard craze of the first decade of the twentieth century. Unlike many other postcard artists who produced their drawings for established publishers, Anderson set up his own publishing company - The Cynicus Publishing Company - and for a brief time achieved both fame and fortune. Alas, the success was as short lived as the postcard craze and by 1911 the business faced financial ruin. Poor Anderson lived for the next two decades in poverty and was eventually laid to rest in an unmarked paupers' grave. Now that's the kind of story we want for Christmas. Bah Humbug to the lot of you! 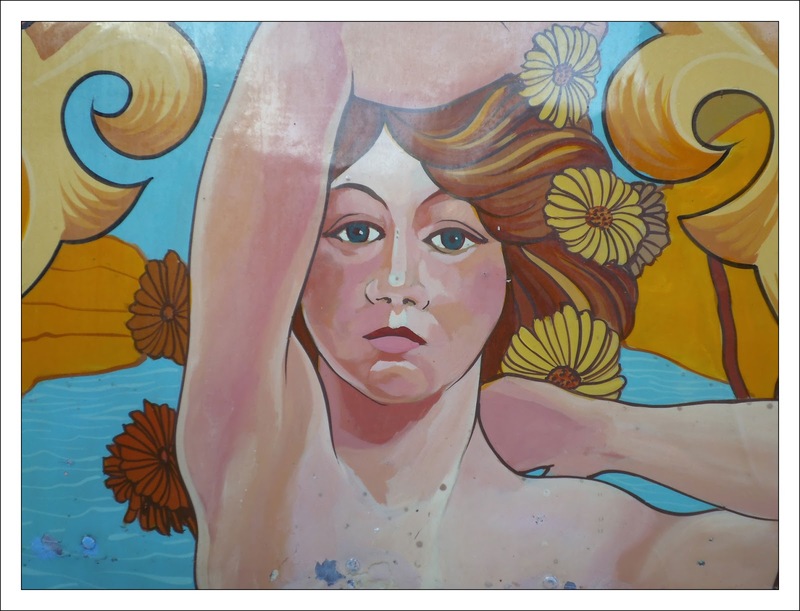 After reading this you can cheer yourself up by reading posts from all the optimists over at the Sepia Saturday Blog. We went to the German Christmas Market in Manchester yesterday - a splendid day out. But it was this wonderful combination of images, seen in Manchester Victoria Station, which will remain in my mind : a modern triptych. I have always been fascinated by information, and books have always been a love of my life. And a man can dream, can't he? The devil is in the detail, they say. 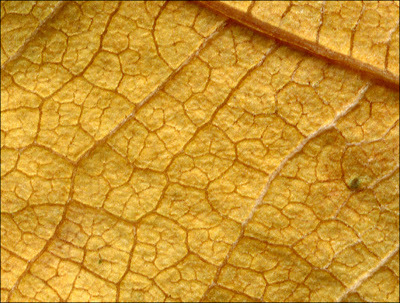 But so often with images it is the very opposite, the detail is where the beauty, the unexpected, the entrancing resides. Last Sunday we went to a Victorian Christmas Fayre. It was mostly fake shawls and cheap china, but there was an old powered fairground ride with exquisitely painted panels. This woman looks straight at me, demanding to have her photograph taken. Our Sepia Saturday prompt this week shows an advertisement for Oshkosh Overalls and Workshirts, "the big overall for all big jobs". 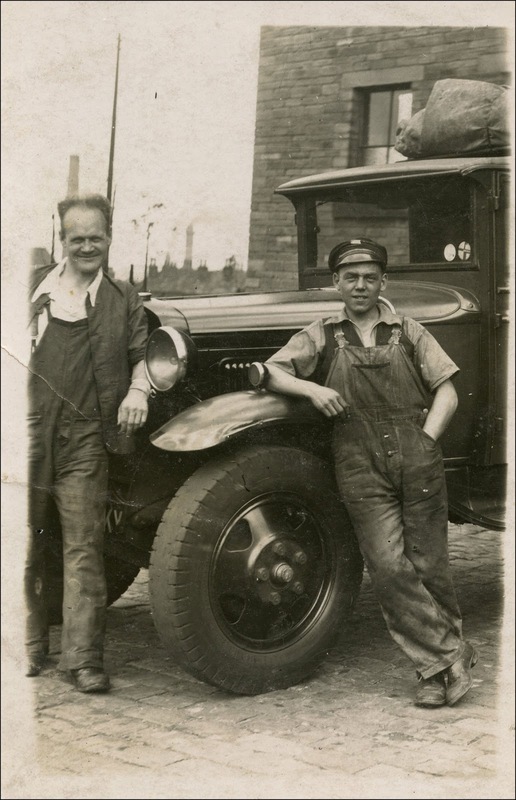 My initial reaction to the prompt was that I had several photographs of all manner of relatives in overalls - I come from a long line of mechanics and machine men: oil and engine grease lubricate my very genetic code. 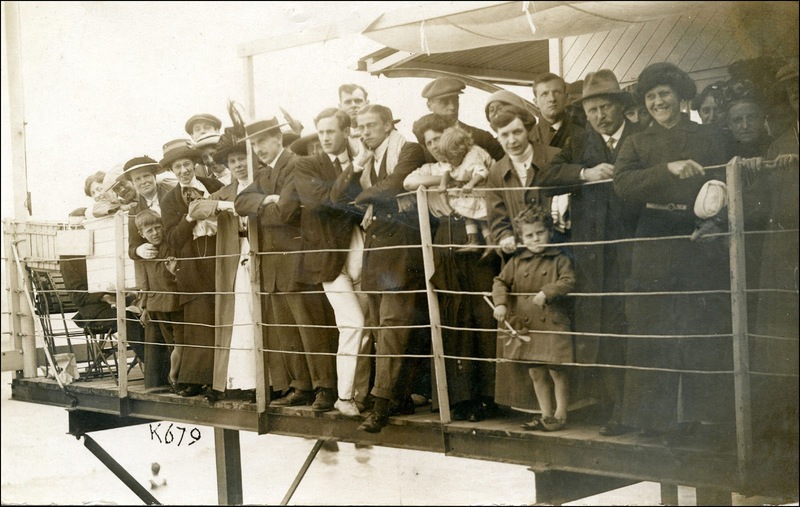 Perhaps it would have been better for me if I had come from a long line of archivists, at least that would have meant that my family photographs would have been catalogued and I would have been able to find the photographs I was looking for. The only "overall photograph" I could put my hands on - without too much hard work - was this one which shows my Uncle John (left) with a fine looking wagon from the 1920s or 1930s. I suspect that I might have used this image on my Blog before but all my efforts to track down a new "old" photograph were to no avail. In many ways it should have been a photograph of my father, because I always associate overalls with him. Even after he retired he would often go off to his shed or garage, put an old pair of overalls on and start sorting through his collection of screws, or bolts or gears or whatever. There is something almost timeless and constant in this vision of my father in overalls, it is part of the background to my life, like Yorkshire, boiled sweets and fish and chips. But as I searched through a distant shoebox looking for a picture of my dad in his overalls I came across this letter. As you can see it is a letter from a firm of printers in South Africa trying to find out if my father was still interested in applying for a position with them. 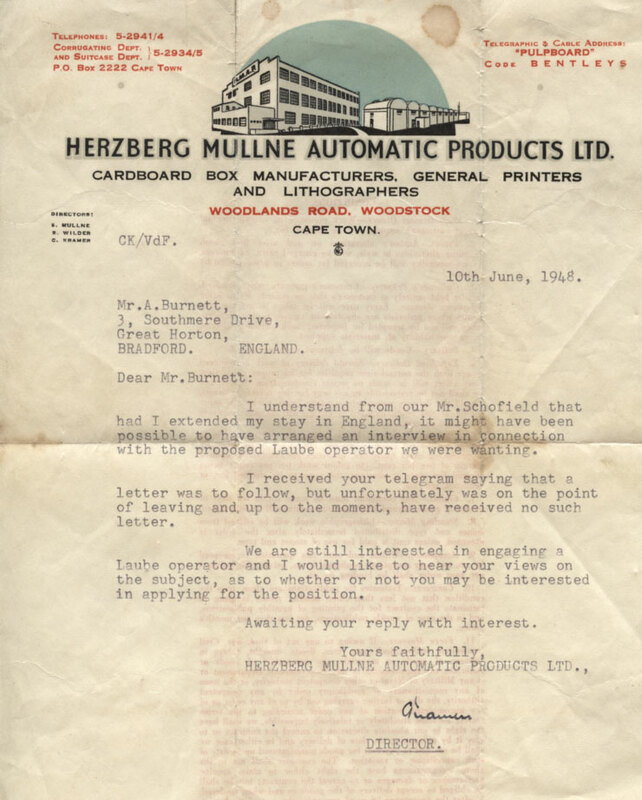 There is talk of a telegram from my father and a letter to follow. The letter fills in some of the gaps in the story I vaguely remember being told about. The story of a job being offered in South Africa, my parents on the verge of emigration and then backing out at the last minute. Sat here 64 years later I wonder what caused them to send the telegram, back down from the job, and remain in West Yorkshire. 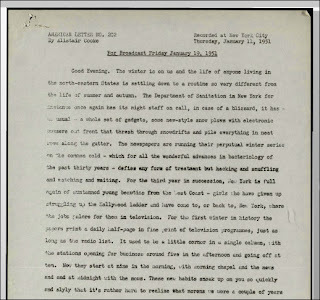 And then I notice the date of the letter which was sent just seven days before I was born. What might have been, what might have been. 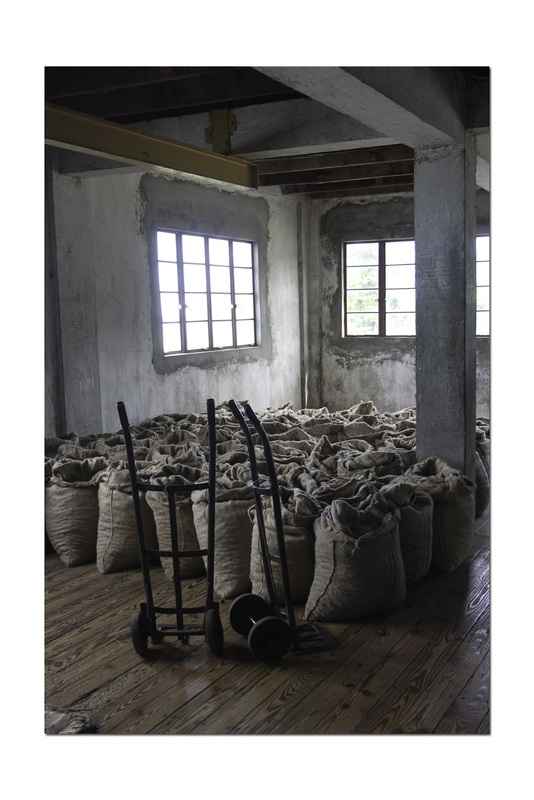 Take a look at the overall contributions for Sepia Saturday 155 by going to the Sepia Saturday Blog and following the links. One of the reasons for the new computer was the need for a machine with enough power to run Adobe Lightroom. Over the years I have accumulated thousands of photographs (negatives and digital) and I dream of being able to catalogue the resource. Lightroom promises the digital equivalent of the old photographers' darkroom, and considering that some of my happiest times have been spent in a dark room with acid fixer eating away at my fingertips, as soon as the new computer arrived a copy of Lightroom wasn't far behind. Cataloguing all those images is going to be a major task and I am working backwards, starting with my most recent photographs first. This photograph of a nutmeg warehouse and processing factory on the island of Grenada was taken less that a month ago. Already the memory of the trip is beginning to fade, and therefore the catalogue information I am currently adding will prove useful in time. I'm back. Well at least I think I am. That looks a bit like me, and it is how the new computer seemingly sees me (it has an eye which, unnervingly, always seems to be looking at me so I have now stuck a Post-It Note on it to cover it up). The new machine was surprisingly easy to set up, but reloading the various bits of software that are an integral part of my life has been slightly more problematic. Things tend not to be in the same place, pressing buttons or moving mice tend not to have exactly the same effect. No doubt I will get used to it soon, but don't be surprised if there are a few teething problems (如何在地球上發生的呢？). Normal Blogging should return tomorrow. When I returned from holiday a couple of weeks ago I switched on my somewhat ancient computer and, like an old man climbing a steep hill to collect his pension, it started loading Windows. A day and a half later it succeeded! Well a nod is as good as a wink to a blind donkey and I quickly realised that it was time to go into the marketplace and buy a new machine. For the last week, I have been immersed in that strange world of computer specifications; trying to decide whether I should buy expensive and sleek or cheap and nasty, a Mick or a Mac, a desktop or a black-bottom (you will note how easily I have mastered the language). I will not bore you with what I have bought - other than to say that it leans heavily towards the cheap and nasty end of the scale - but I feel I must warn you that it is due for delivery today and therefore I suspect we might be in for a technological interregnum whilst I battle to discover which wire I plug in the wall socket and which I tie my mouses' tail to. I thought it wise, therefore, to get my Sepia Saturday post up before the change-over period commences. 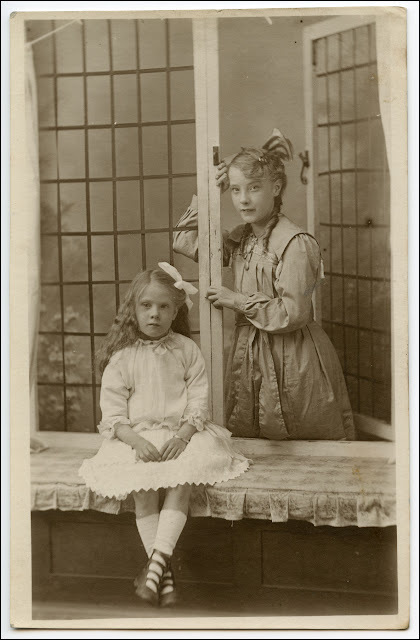 Our Sepia Saturday prompt this week has a delightful pair of girls who may appear to be sisters but in fact are not (for the full story - or rather for the start of the story, you will have to look at my post on the Sepia Saturday Blog). My response to the prompt is a photograph of two sisters : my mother Gladys (on the left) and her sister Amy (standing). I suspect I may have used this picture before several years ago and for those with a long memory (4Gb on-board and a massive 1Tb hard disk) I do apologise. In his introduction to one of my very favourite books, The Old Wives' Tale, Arnold Bennett talks about seeing two old sisters dining in a restaurant in Paris and speculating what their lives must have been like and this speculation became the basis of what is a wonderful novel. My picture is like a telescope viewed from the other end : here you see the two young women and you need to speculate what their lives were like. If you do the experiment with my photograph of Gladys and Amy, you will have to use your imagination. However, if you do the experiment with Lala and Elgie (the two girls in the theme image) you might want to make use of a Google search. Whatever sepia exercise you want to indulge in, you starting point, as always, is the Sepia Saturday Blog where you can find links to not only all the other Sepia Saturday contributors, but also to the original photograph of LaLa and Elgie. 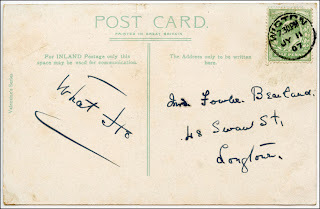 I imagine this postcard sent in July 1907 to my Great Uncle, Fowler Beanland, is the early 20th century equivalent of a Facebook "poke". I have never quite understood the concept of "pokes", but I suppose they equate to "hello there", "how's things" or even "what ho". But what are the chances of those electronic pokes lasting 105 years? And what are the chances of some 22nd century blogger using them as the subject of a daily post? 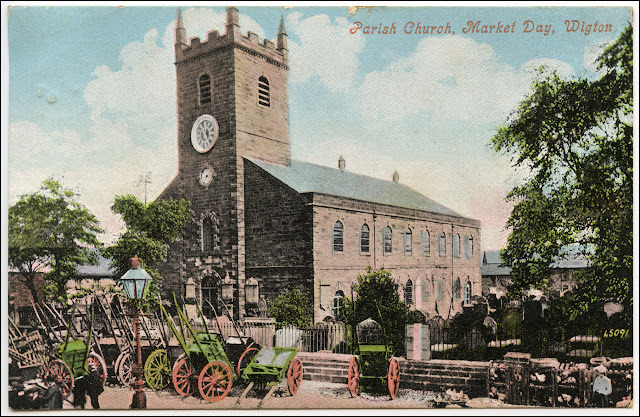 They will not open a window to a world of market day carts lined up outside St Mary's Church, Wigton, nor will they send our intrepid blogger searching to find out if the same view exists today. They will simply be a digital reminder that A poked B on the 11th of July. Nothing can be done about it; that's progress I suppose. What Ho! With the best will in the world, when you have been together for a long time you sometimes run out of things to say to each other. When you spend most of your waking hours together you occasionally find that conversation, like some semi-desert rivulet, dries up. During each week, there are a limited number of conversations you can have about the weather, the state of Middle East politics, and the sensory allure of deep fried pigs ears. And so it is with me and Amy. I have always thought that the sight of dog and owner walking together in muted misery is a sign of a dysfunctional relationship in training. As the great Mildred Henderson was apt to say, "Families that walk together should talk together". And consequently, if you happen to spy Amy and I during one of our twice daily walks you are as likely as not to catch us deep in conversation about art, philosophy or the previous night's Bushtucker Trial on I'm A Celebrity ("What is the matter with them," she is prone to say, "whitchetty grubs are full of protein"). But all too often, by the time that we reach the Crematorium Gates (this is a geographical reference rather than some Miltonian aphorism), our conversational banks are in need of quantitative easing, and that is the time that we switch on whatever Podcast fate (and iTunes) has decided to download for us. There are, of course, our regulars, The Archers, Guardian Football Weekly, What The Papers Say: the staple diet that keep us going come rain or shine, feast or famine. And there are the Epicurean delights, those auditory morsels that make life worth living, walks worth walking. 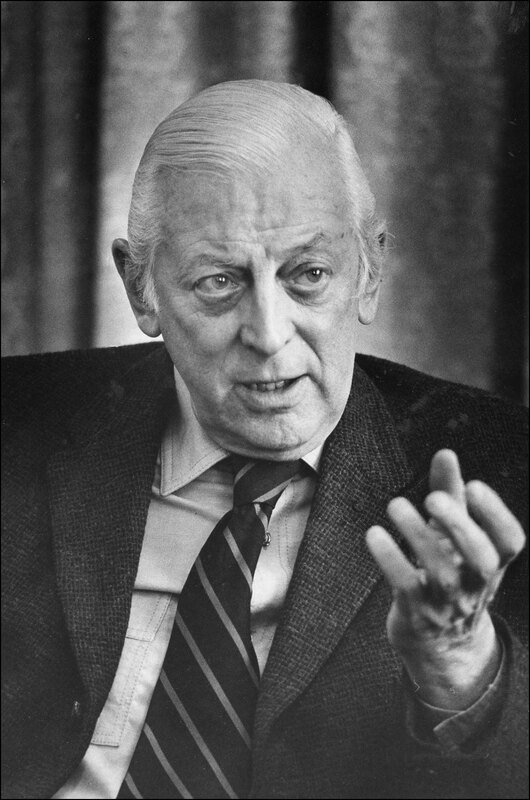 And so it is with the BBC archives of the late Alistair Cooke's Letter From America. As if to prove that it doesn't always get things wrong, the BBC have decided to make available over 900 programmes from it's substantial archives of weekly broadcasts by the journalist Alistair Cooke, which cover the period 1946 to 2004. You can listen to them on-line, download the Podcasts, and in some cases read the actual scripts at the BBC Letter From America webpage. I am not sure how familiar people in the USA are with Cooke's work, but the truth is that most people in the UK, and many other parts of the world, saw America through his eyes for much of the second half of the Twentieth century. And even though the events he writes about and talks about have now long sunk under the dust of history, his words still retain the lyrical architecture and crafted economy of a great writer. 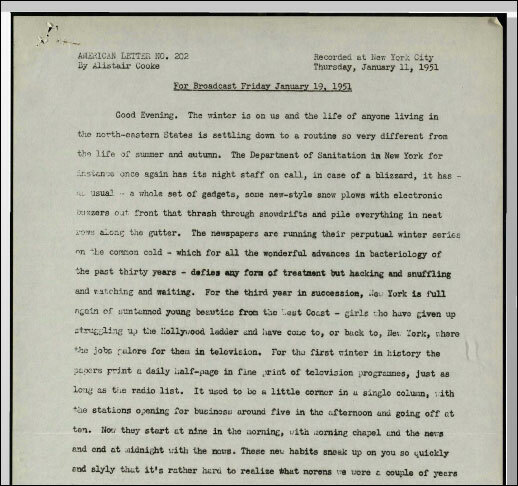 Like so many of my favourite writers - Pepys, Dickens, Arnold Bennett - you get the feeling that Cooke would have been an enthusiastic blogger had the technology been available at the time. Whether you have a dog that needs walking or not, I would recommend that you give him a listen. I have a box full of cameras of all shapes and sizes (note to my wife - I haven't really dear, I am just using this phrase for literary embellishment), but so often I finish up taking photographs with my mobile phone. My mobile is always with me, always reliable, and always ready for whatever life may throw at it (note to wife - just like you my dear). So this is the first of a short weekly series of pictures taken on my iPhone. This was taken last Monday tea-time in Church Lane, Brighouse. 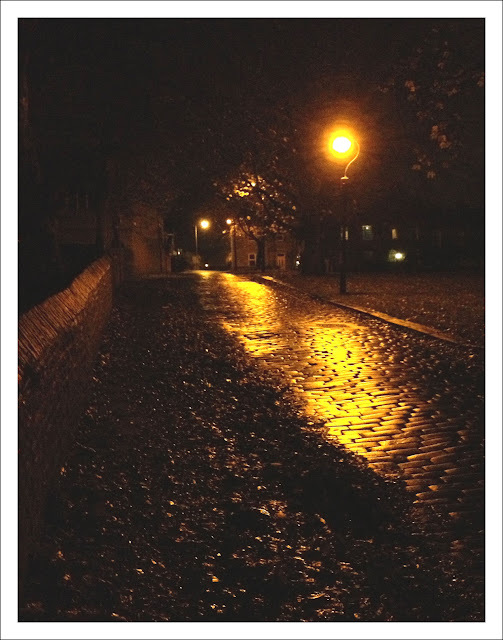 The road is still laid with stone cobbles; a remarkably effective road surface in terms of durability. The pavement is covered with the detritus of Autumn and once you add the street lights you are left with a soothing golden glow. It is enough to warm your heart on these cold November evenings (note to wife - just like you my truffle). 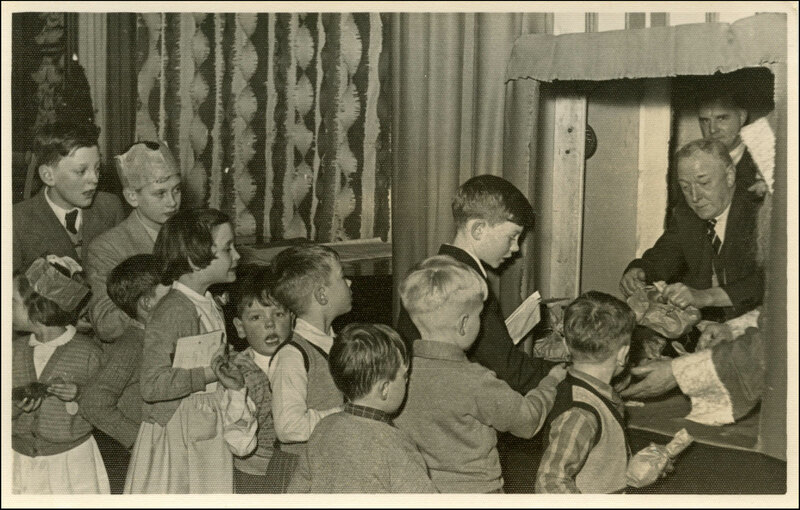 For Sepia Saturday 152, the theme image shows a group of school children intent of reading their library books. 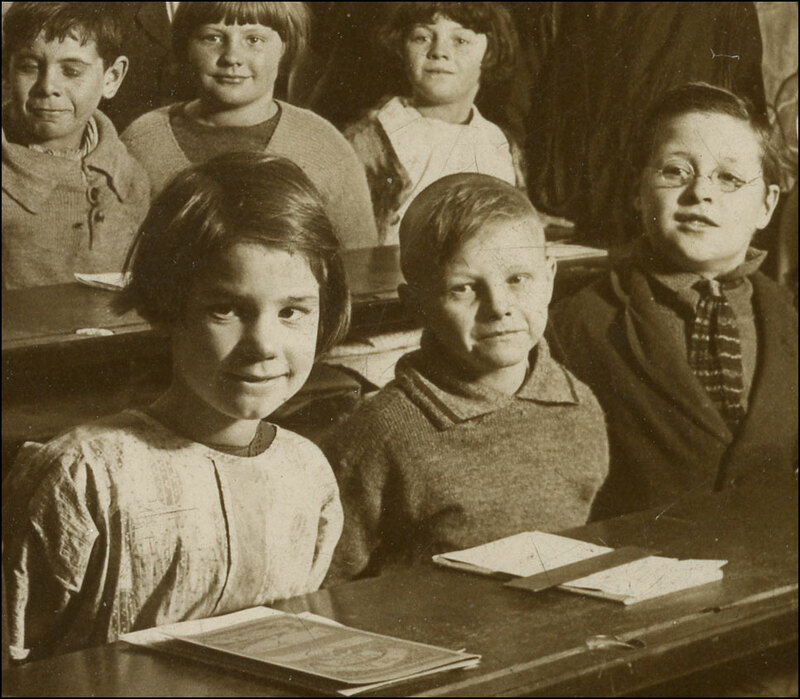 I wanted to use one of my old postcards this week so I started searching through them looking for children reading. The closest I could find was the above photographs which has children and it has books, but there is a certain passivity : they are posing for the camera rather than reading their books. 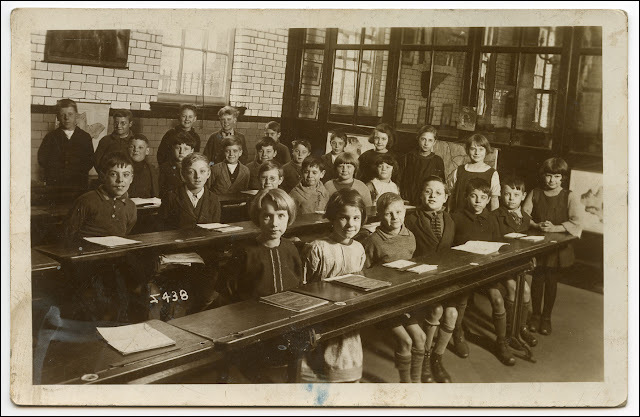 I rather suspect that the children in the theme photograph were posing as well, the teacher having just told them "now, make it look as though you are reading your books". My children (and I have no idea who they are or where they are or, indeed, when they were) may be passive in relation to their schoolbooks, but there is nothing passive about their faces. My selective enlargement focuses on just six of them, but you could repeat the process again and again and come up with energetic face after energetic face. You could look for happiness and sadness, hopes and fears, triumphs and disasters, and find examples of each. Each of the thirty faces is a life about to be led, a story about to be told, a drama about to be enacted. Who needs books when there is a photograph to be read? 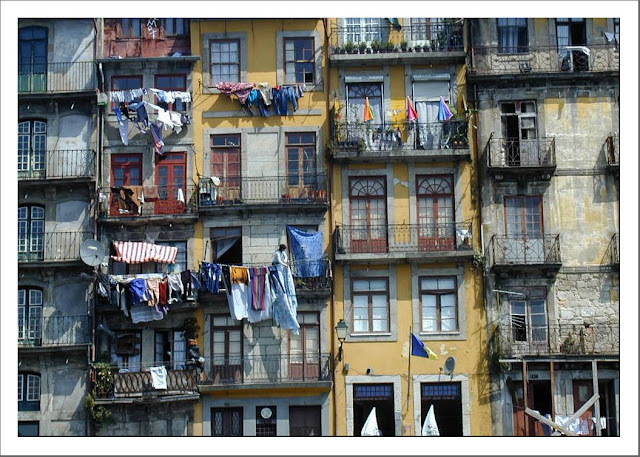 I have made a start on giving News From Nowhere a bit of a Spring Clean and you will see that there is a new Header. Some new elements will appear on the Sidebar over the coming days as well. 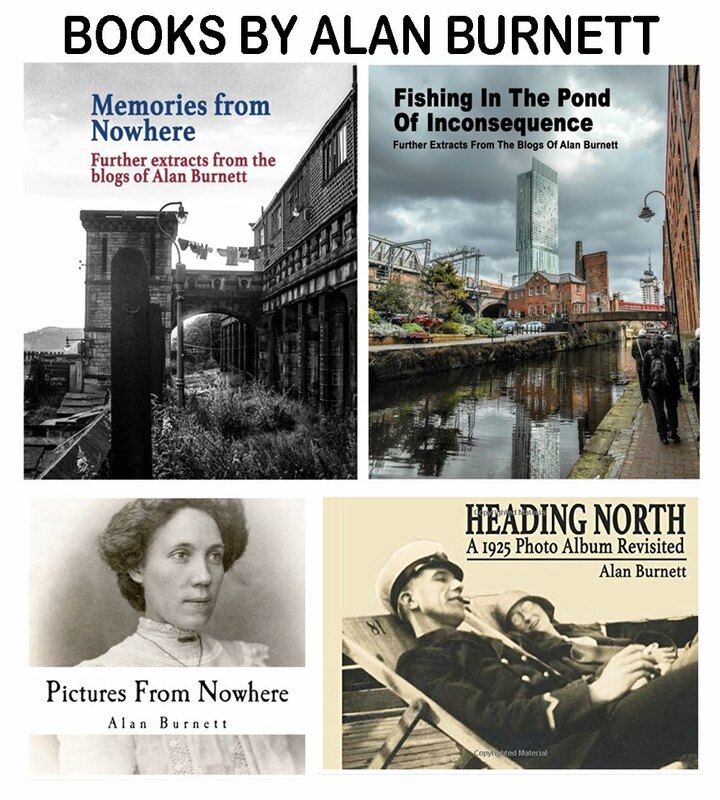 I have decided that trying to keep two blogs going and finish the novel by next June is a trifle over-ambitious, so I have decided to put Alan Burnett's Picture Post on ice for the time being and concentrate my blogging energies on News From Nowhere. The series of scans of old negatives will not cease, however, but will merely be incorporated into the NfN schedule. 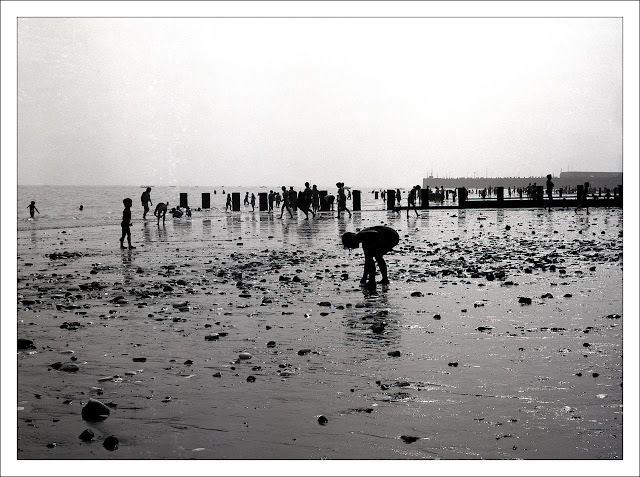 The picture used in the new Header is one such scan of a picture I took some 30 or 40 years ago in either Cleethorpes or Skegness, I forget which. And here is another photograph from the same day out. It is Monday morning and it looks frosty outside. Earlier, I sent Amy out into the garden in the hope that she would report back on the ambient temperature, but she is still not talking to me after being incarcerated in kennels for the best part of a month. But it certainly looks cold and therefore time for a couple more of the photographs I took on holiday. The first was taken from Shirley Heights on Antigua and is looking down towards English Harbour. If you strain your eyes enough, you will just be able to make out the buildings that form the historic Nelson's Dockyard, and that is the subject of my second photograph. 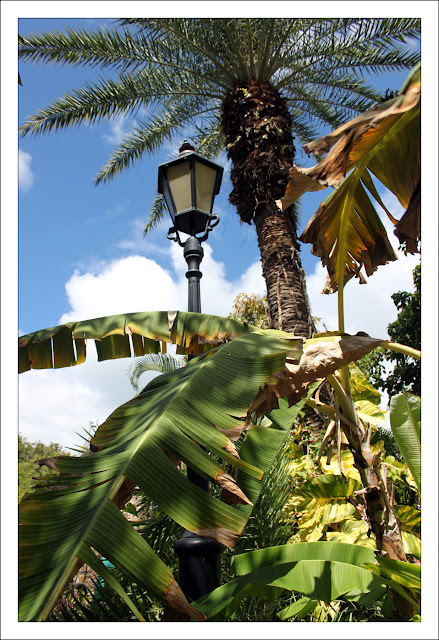 The combination of the palm trees, the tropical vegetation, the clear blue skies and the rather English cast iron street light seems to sun up what was a magical place. Back in the days when computers were as big as a suitcase and as slow as a corporate giant's tax return, there used to be a little programme you could buy which would generate Mandelbrot Sets. These were a kind of infinite pattern, where you could keep on zooming in and revealing patterns within patterns, detail within detail. 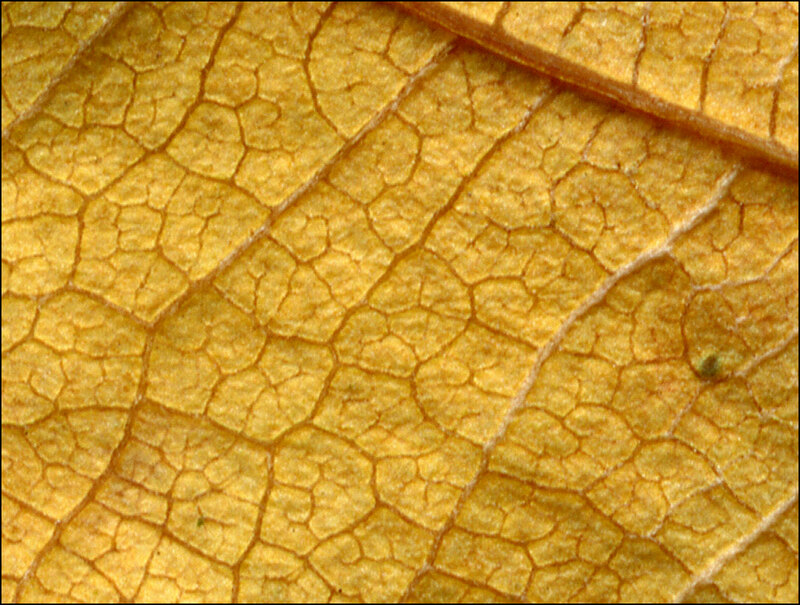 They had an almost natural feel to them; like coastlines pictured from space or the growth of bark on a pine tree. 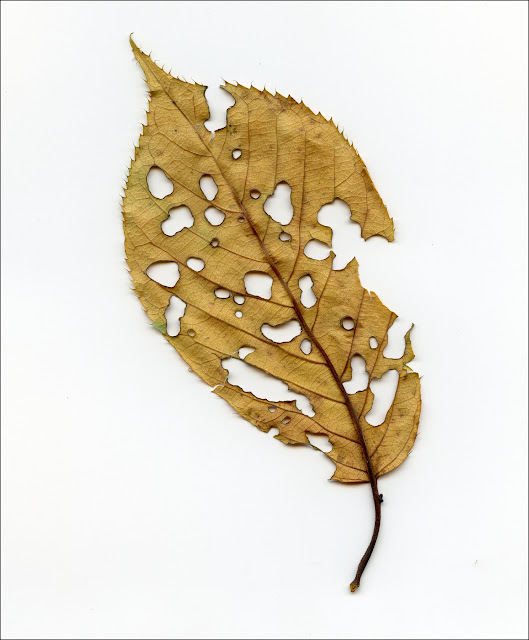 I was reminded of all this yesterday as Amy and I were walking through the Crematorium and I picked up a leaf from the ground. 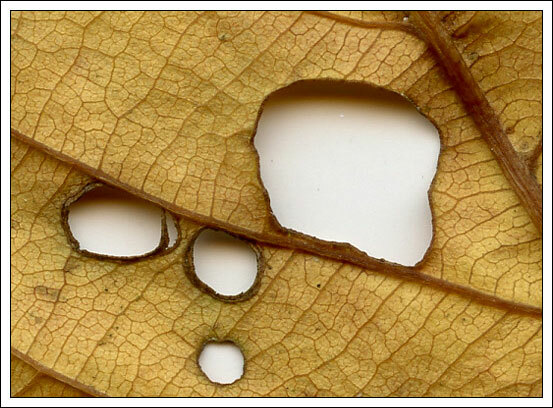 Like a Mandelbrot Set something as simple as a half-chewed leaf can, with the aid of a half-decent scanner, allow you to seek patterns within patterns, detail within detail. Our Sepia Saturday theme image this week shows an old telephone exchange. 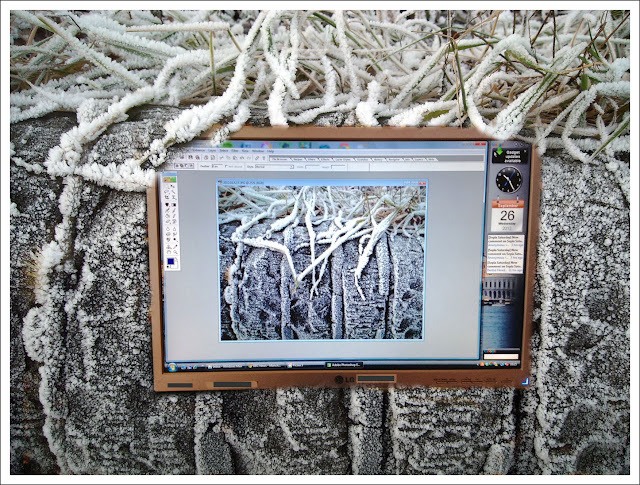 Dozens of young women plug wires into boards connecting people from opposite ends of the earth. It is a bit like an old-fashioned Internet when you think about it, a pre-digital web spun out of twisted wires rather than fibre optics. I say this, however, from the standpoint of someone who has never really quite understood how the internet actually works : for all I know there is some freshly-permed lass who has just plugged a wire into a socket and connected your computer to mine so that you can read this post. But, I digress and I am in danger of getting my wires crossed. The theme image immediately sent me searching among my collection of old prints and negatives for photographs featuring telephones. And to my surprise, I found precious few, and none at all dating from more than about 30 years ago. I am not sure why I was so surprised; although telephones are so ubiquitous these days, it was well into the 1970s before we had a telephone at home. All the time The Lad had been at University, I have been able to contact him on an almost daily basis via telephone, to hear of his triumphs and disasters, to receive his requests for food and cash, and to reassure myself that the chap is still safe and well. My photograph dates back to 1968 and shows my desk at Fircroft College in Birmingham. I have always been fond of photographs like this; ones you can have a good old nosey about in, see what people are reading, writing, drinking and - if the box of Swan Vestas is anything to go by - smoking. 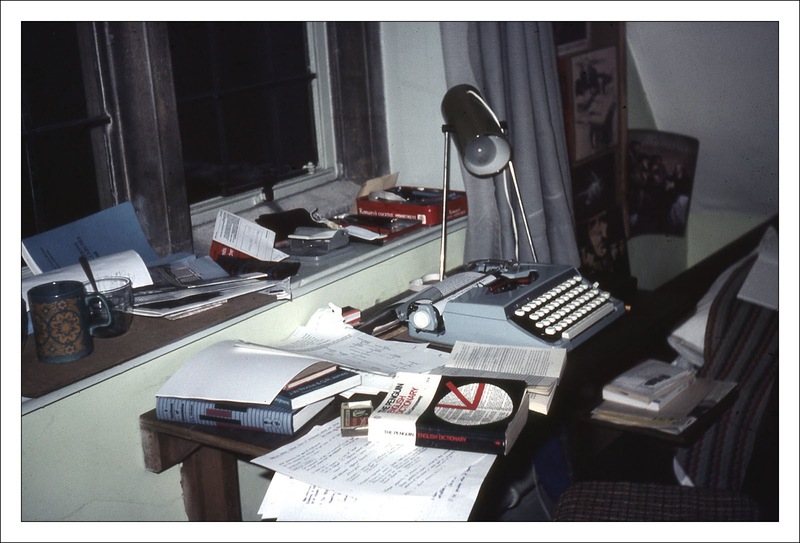 If you look, you will find my beloved old typewriter, my precious old dictionary, even my ever-faithful hole punch; but you will not find a telephone. 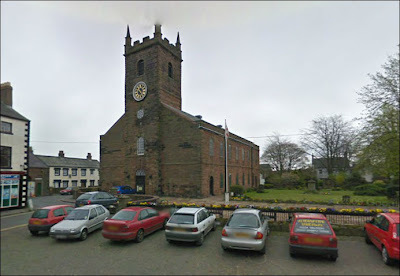 Although there were public call boxes in the building, neither my parents nor my then girlfriend (then girlfriend, now wife) back in Yorkshire has access to phones. 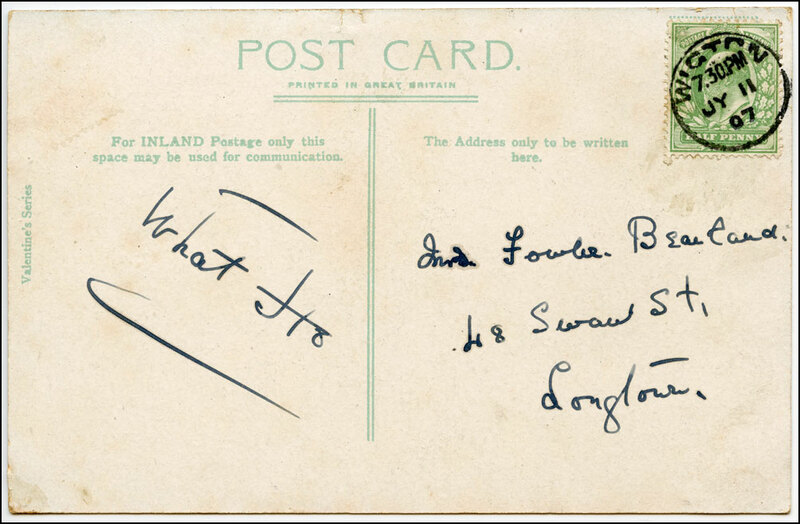 We would communicate by letter or by postcard, scribbled messages on bits of paper and card. I am tempted to say that we were better for it, but no, that isn't the case. I would have gladly exchanged my Parker pen for a telephone. There was many a lonely night when I would have liked nothing better than for someone to have plugged a wire into a socket and brought me a little closer to those I loved. You can get connected to other fascinating old photographs by going on over to our digital image exchange, Sepia Saturday, and following the links. Whilst we were away, I kept getting messages from home telling me how miserable the weather was. There is a great deal of satisfaction to be gained from the knowledge that whilst you are soaking up the Caribbean sun your nearest and dearest are dripping in the land of mists and mildew fruitfulness. Since we have been back, however, the weather here in Yorkshire has been absolutely delightful, combining a sun that doesn't burn with a Autumnal sharpness that re-awakens the spring in your step. 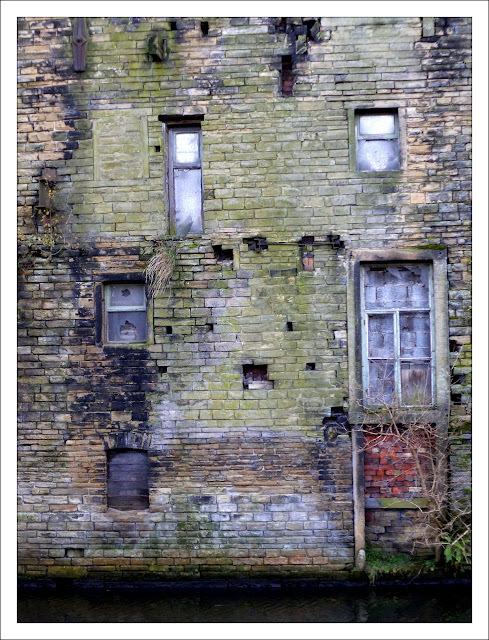 It was such a pleasant day yesterday that I walked from Elland to Brighouse along the canal towpath and, along the way, I took this photograph of an old canal-side mill. Like the face of an old man or woman, the building has the lines and furrows, scabs and wrinkles that depict its passage through time. It is almost a complete Economic and Social History book in a single image. 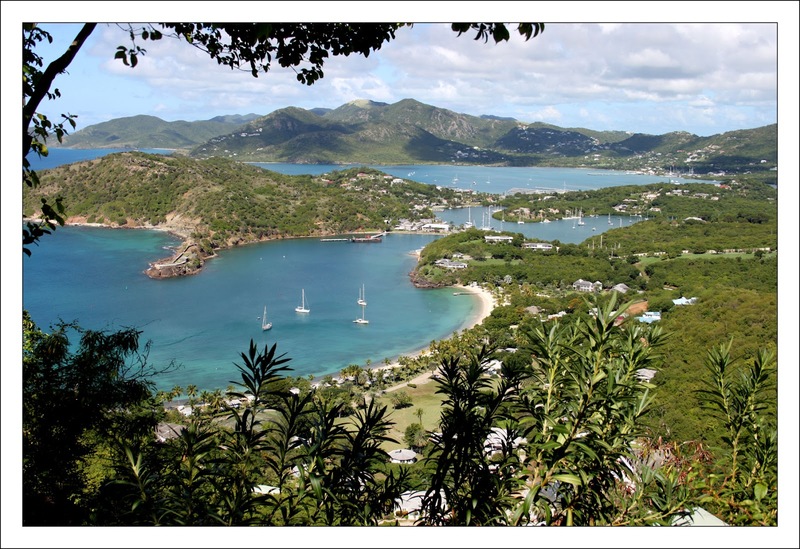 Oh, the palm-fringed white sands of the Caribbean were wonderful - but this is home. We were half way up a mountain in Grenada. 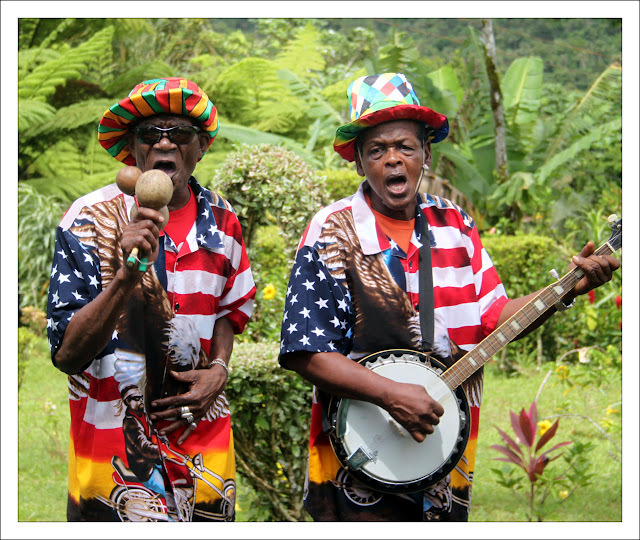 We had stopped for some refreshments on the edge of a national park and whilst we drank rum punch a Calypso band entertained us. They were singing an endless version of "Yellow Bird". Perhaps it was the only song they knew, but what does it matter : it was perfect for the time and the place. I was tempted to include a YouTube clip of the song, but decided against it. Everybody knows the tune, it is part of our shared heritage. Far better that the haunting melody should spontaneously emerge from your deep subconscious and then perform gentle acrobatics in your mind for the rest of the day. That is very bad, Makes me feel so sad. You more lucky than me. I'm back. OK, the cases have still to be put away, the washing has still to be done, the thick winter vests have still to be got out of storage : but, I'm back. I am glad to report that our ship managed to avoid all the bad weather and delivered us more or less three and a half weeks of wall to wall sunshine. The two long Atlantic crossings provided plenty of time to relax, eat and drink (Oh, definitely drink). It also provided plenty of opportunities to write - it is amazing what you are driven to do when you have no Internet link and an in-cabin television choice which was limited to Sky News and re-runs of Cash In The Attic. And so I managed to get a further 22,000 words of the novel chalked up which takes me up to the end of Part 1, which is effectively two-thirds of the way through. If I can keep my focus (and maybe throw in two or three more trans-Atlantic crossings) I might just meet my target of getting the whole thing finished in time for my 65th birthday next June. I have lots of new ideas for the Blog as well and over the next week or two you can expect to see some changes. For the next few days, however, I just want to share a few of the images from the recent trip' starting with this view of the beach in Barbados. 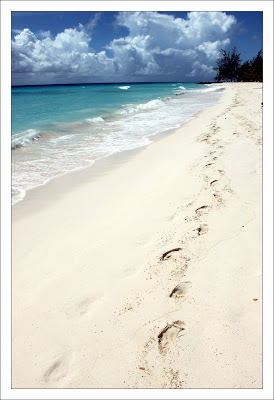 The footsteps are my own - out and then back - and that gorgeous white stuff on the ground is sand and not snow. It is an image which will provide me with a visual hot-water bottle during the winter months to come. That's it. Don't tell Amy, but the bags are almost packed and our passports have been dusted off. The packing has been slow and difficult as we have had to do it in secret because as soon as Amy sees the cases, she sinks into canine depression. So, each evening we have waited for her to fall asleep in front of the fire and then tip-toed out of the room to sneak upstairs and undertake some surreptitious case-packing. She will discover the full depths of our subterfuge on Thursday morning when we take her to the K.E.N.N.E.L.S. but at least then we will be able to make a swift getaway and allow our guilt to evaporate slowly in the sub-tropical sun. 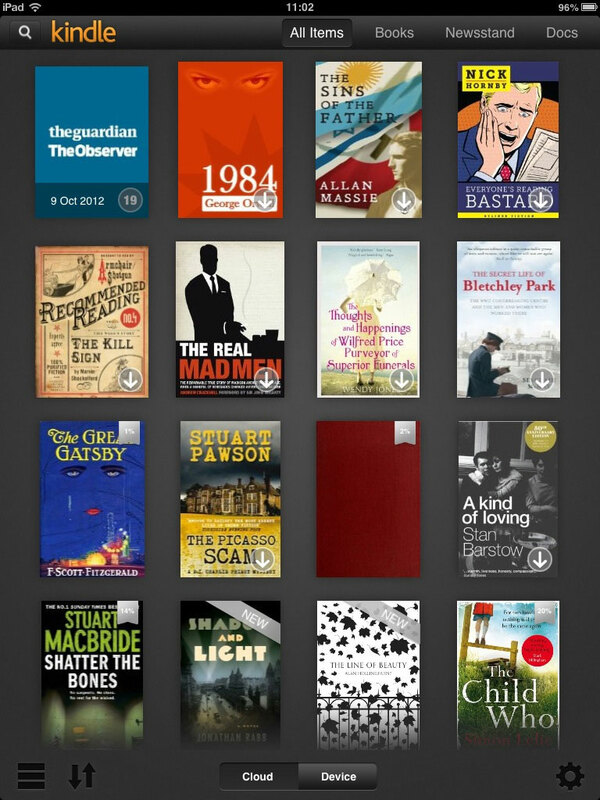 My Kindle is loaded up with nigh-on 100 books and I have my iPad primed with an endless supply of virtual paper. I have downloaded my music and backed-up my documents. I am ready for the trans-Atlantic digital winter. 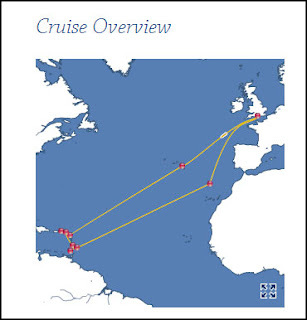 We sail from Southampton on Friday and head, via the Azores, to the Caribbean. There we island-hop and sit in the sun and drink rum. Hopefully I will also get the opportunity to meet up with a batch of my West Indian relatives. And then the boat turns around and sails east, calling in at Madeira and then back to Southampton. The whole trip will take almost four weeks, which is time enough for any man to work his way through 100 or so books. WiFi is as transient and expensive as an honest journalist on the high seas so don't expect to hear from me during the holiday. But I will be back in November, well-read and well-watered, and ready once again to bring you more News From Nowhere. Sepia Saturday 145 : The Boy With The Mona Lisa Look. Our Sepia Saturday prompt this week features a picture of three young lads with their football boots around their neck. Some strange process of association caused me to think of this photograph of an unknown young lad standing besides a gate. Perhaps it is the fact that the combination of his stance and his short trousers leads the eye downwards towards what are a pair of substantial shoes. 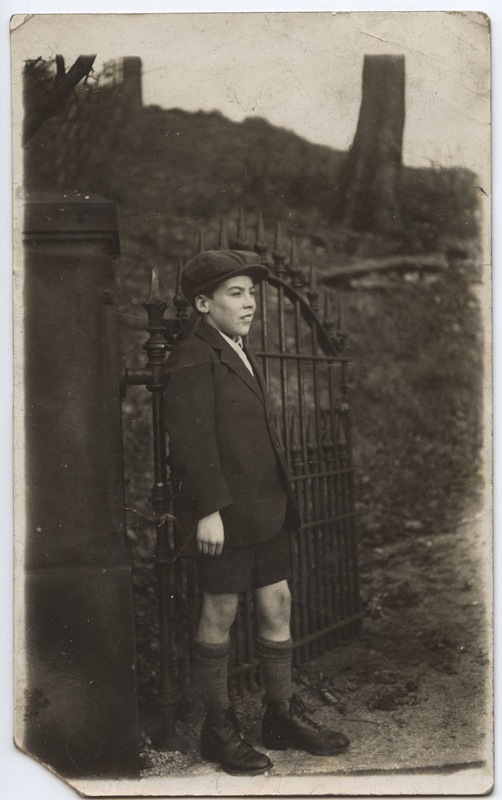 I have no idea who the lad is, where the photograph was taken or when it was taken. I bought it for a few pence at an antique stall some years ago. It appeared lost and I just felt it needed rescuing. It recorded a life about to happen. a life which surely, by now, will have finished. There is a pensive look on his face, almost as though he is looking down the road and into his future. But, there again, he might be fed up of standing there waiting for the photographer to press the shutter and thinking of nothing more than his dinner. Whatever thought may have given rise to it, there is a Mona Lisa quality about his expression, something which will stay with you long after you do the sensible thing and turn to some other Blog to read. You can turn to some other Blog to read by going to the Sepia Saturday Blog and following one of the links you will find there. But don't be surprised if that Lad's enigmatic look comes back to haunt you for the rest of the day. Long. long ago - when I was only a young lad - before cars and planes and light bulbs and fridges and telephones and bacon sandwiches were invented, people would dread the approach of winter. Winter was a time when the sun rarely shone, when the crops rarely grew, and when it was far too cold for the chicken to lay their eggs. People would have to plan for a times of scarcity, a time of poverty, and a time of want by putting aside a little in the time of plenty in preparation for the lean and hungry times ahead. Which explains why I have been a little absent of late as I try and stock my digital larder. Here I stand at the end of September contemplating the digital winter ahead. In a couple of weeks time the Good Lady Wife and myself will pack our bags and depart for warmer climes for the best part of a month. And whilst the Caribbean might have wall-to-wall sunshine, clear blue seas, and pina coladas, it is not so well endowed in relation to broadband. This is particularly true of the rather large boat which will be our home. Its' broadband connection is as narrow as a bigots' mind, as expensive as a gold filling, and as slow as a politician's apology. So here I stand (OK, here I sit), pickling digital downloads, laying aside some of the plentiful fruits of my speedy WiFi in anticipation of the lean times ahead. Digital books hang from my Kindle Library like salted hams hanging from the pantry ceiling. MP3 tracks are stacked away in digital cans like sardines packed in brine. I am a farmer of dreams and I am preparing for the digital winter. Well thank goodness International Madness Week is behind us for another year and we can concentrate on order, logic and rationality. 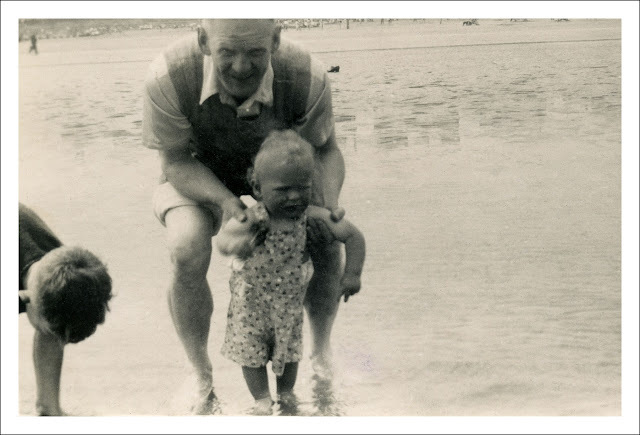 And what could be more ordered and logical than this charming child paddling in the sea in some northern sea-side resort, proudly supported by his father whilst a renegade sibling tries to get in on the act. Yes, that is me in that pretty patterned bathing suit. The theme image for Sepia Saturday 144 features a headless body and provides a perfect example of frames of view joining battle with ordered presentation and coming up with something that has an attraction of its own. If my mother (for it must have been her that wielded the family camera in this 1950 photograph) had been more careful, my brother wouldn't have been decapitated nor my father scalped. If she had planned the shot more carefully, the horizon might not have dipped so precariously and there wouldn't have been such an expanse of North Sea dominating the view. But then the photograph would have been ordinary. It might have made a statement but it wouldn't have asked any questions. And that, would have been boring. You can fight boredom this weekend by visiting the Sepia Saturday Blog and following the links to convicts, headless bodies and all manner of strange and wonderful images.